D-Link’s Web Smart DES-1316 is the first of its kind in the market. 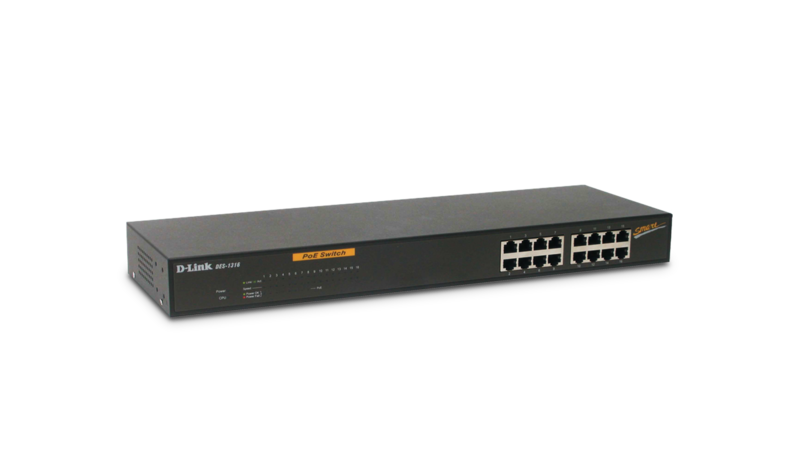 It is equipped with 16 10/100BASE-TX Fast Ethernet ports, 8 of which support 802.3af Power Over Ethernet (PoE). It is an effective solution for small and medium businesses deploying wireless networks and adding multimedia applications. It provides Smart features that are ideal for simple QoS applications and basic monitoring tools. The Power Over Ethernet option supplies power into 802.3af compliant devices such as IP phones, wireless access points, or IP cameras. The Web Smart DES-1316 provides QoS features that are suitable for today’s multimedia applications. Through a Web-based interface, an administrator can set up 802.1Q VLANs to segregate traffic, QoS to prioritize mission-critical data such as voice or video packets, and link aggregation to increase bandwidth. The DES-1316 also provides network monitoring tools such as port mirroring and basic port statistics. Best of all, the password-protected configuration interface can be accessed remotely. The Web Smart DES-1316 has 8 10/100BASE-TX ports that support 802.3af PoE protocol. It is designed to inject up to 15.4Watts per port. Any device that is IEEE802.3af compliant can be attached to the switch; no additional power will be required to support the attached device. This eliminates the need for power rewiring and minimizes the clutter of power supplies and adapters in awkward places such as ceilings or walls. For devices that are not 802.3af compliant, D-Link offers PoE adapters, such as the DWL-P50. The DES-1316 is ideal for today’s popular deployment of VoIP, Wireless APs, and IP Cameras in small to medium business environment. Through its Web-Smart interface, an administrator can easily hard reboot the attached device by a simple click of a button, facilitating network troubleshooting without physically having to go to hard-to-reach places. The Web Smart DES-1316 also supports active circuit protection, which automatically disables a port if there is a short, while the other ports remain active. The auto features of this switch make installation plug & play and hassle-free. No configuration is required. Auto-MDI/MDI-X crossover on all ports eliminates the need for crossover cables for connection to another switch or hub. Auto-Negotiation on each port senses the link speed of a network device (either 10 or 100) and intelligently adjusts for compatibility and optimal performance. If an 802.3af compliant device is attached, the switch will automatically detect the requirements of the device and will supply power accordingly. The Web Smart DES-1316 also features diagnostic LEDs, which display status and activity, allowing you to quickly detect and correct problems on the network. It features a non-blocking wire-speed architecture with an 3.2Gbps switching capacity for maximum data throughput. With wire-speed filtering and store-and-forward switching, the Web-Smart switch also maximizes network performance while minimizing the propagation of bad network packets.